The loudest roar of these world track and field championships came on Saturday night as Usain Bolt lay facedown on the track and in great pain. The roar had nothing to do with Bolt: It was about a surprise British victory. After Bolt took the baton from his teammate Yohan Blake to run the anchor leg of Jamaica’s 4×100-meter men’s relay, their team was in third place. In years past, that would have been a minor obstacle for Bolt, the greatest sprinter in history. This time, he began to gather speed, only to pull up and shout in pain from what appeared to be a left leg injury about 60 meters from the finish line. It was hardly the farewell party that Bolt had in mind when he decided to make this meet the final one of his career. His failure to finish would normally have cast a pall over the rest of the race, but it has been a frustrating meet for Britain, the host country. And with Bolt on the ground and the Jamaicans out of contention, the gold came down to a sprint for the finish between Christian Coleman of the United States and Nethaneel Mitchell-Blake of Britain. The Britons won by five one-hundredths of a second, finishing in 37.47 seconds to the Americans’ 37.52. As the official results flashed on the big screen, the crowd cheered for what was only Britain’s second gold medal of this meet and its first-ever world championship in the men’s 4×100 relay. The night began with a disappointment for the hosts, as the British distance star Mo Farah’s 10-final winning streak at global championships ended in the 5,000 meters. Competing in what he said was his last track event before a switch to road racing, Farah could not produce his traditional devastating kick. He finished second behind Ethiopia’s Muktar Edris, and the American Paul Kipkemoi Chelimo won the bronze. But the men’s relay turned the night around for Britain, and Mitchell-Blake celebrated by sprinting down the track again, this time with the baton between his teeth. Meanwhile, Bolt’s teammates rushed to help him as he lay on the track in the same stadium where he and his countrymen set the world record in this event, 36.84 seconds, at the 2012 Olympics. Kevin Jones, a doctor with the Jamaican team, said his preliminary diagnosis was that Bolt had suffered an acute muscle cramp in his left hamstring, although Jones could not rule out the possibility of a muscle tear. He said that a slight delay at the start of the race — because of the length of two medal ceremonies preceding it — might have contributed to Bolt’s situation. 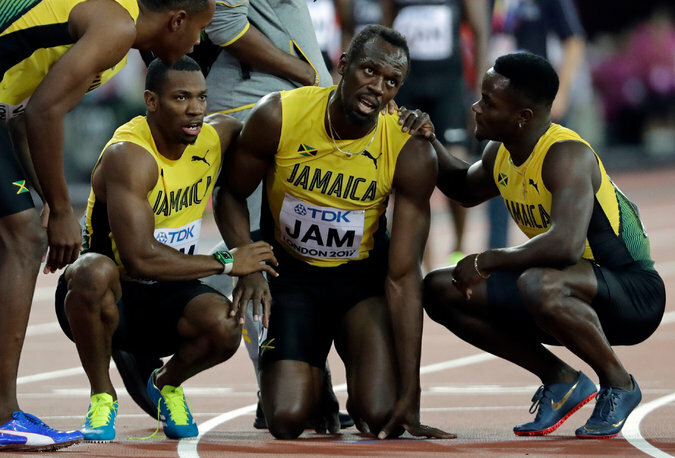 The Jamaican sprinters said they had been kept too long in the “call room,” the holding area that serves as a way station between the warm-up track and the main stadium. Omar McLeod, who ran the first leg for the Jamaican team, also criticized the delay. “We were really trying our hardest to stay warm and keep upbeat, but it was ridiculous,” he said. Still, none of the sprinters from the teams that did win medals had a problem similar to Bolt’s, not even Justin Gatlin, the 35-year-old American who had upset Bolt in the 100-meter sprint here (and who was booed again by some members of the sellout crowd during introductions). Bolt won three gold medals at the London Games, confirming his status as one of the greatest Olympians in history. He added three more golds at the 2016 Olympics in Rio de Janeiro, but this season proved to be one too far for Bolt, who will turn 31 this month. At these championships, he had to settle for a bronze medal in the 100-meter race. And then came the relay. No morning person, he made an exception this time and took part in the early heats, running the anchor leg and helping Jamaica win its heat to qualify for the final. Bolt put on a good show before the final, too, joking with the mascot in the corridor leading to the track and playing to the crowd once he emerged from the tunnel. But there would be no grins or laps of honor after this relay was run, and if this was indeed his final official race, it was hardly a reflection of the mood and victories that preceded it. Bolt looked anything but invulnerable as he hopped to a halt, shouting an epithet while his rivals continued to accelerate. He looked anything but superhuman as he fell to earth, although he did manage a somersault on the way down. Though he was eventually able to rise to his feet, eschewing the wheelchair that had been brought for him, and hobble across the finish line long after the race ended, with his Jamaican teammates walking slowly and grimly beside him, he soon dropped to the track again and grimaced. He later rose again and limped away without speaking to reporters. He received treatment from his longtime massage therapist before returning to the team hotel. If this was truly the end, Bolt finished with 14 career medals in the world championships, 11 of them gold, and with eight Olympic gold medals. But there was no final flourish for a man who has been not only one of global sport’s great athletes, but one of its great entertainers as well.